There have been a lot of smart computers on TV and movies. We often think among the smartest, though, are the ones on Star Trek. Not the big “library computer” and not the little silver portable computers. No, the smart computers on Star Trek ran the doors. If you ever watch, the doors seem to know the difference between someone walking towards it, versus someone flying towards it in the middle of a fist fight. It also seems to know when more people are en route to the door. Granted, the reason they are so smart is that the doors really have a human operating them. For the real fan, though, you can buy a little gadget that looks like an intercom panel from the Enterprise. That would be cool enough, but this one has sound effects and can sense when someone walks into your doorway so they can hear the comforting woosh of a turbolift door. Of course, for the real hacker, that’s not good enough either. [Evan] started with this $25 gadget, but wanted to control it with an Arduino for inclusion in his hackerspace’s pneumatic door system. He did a bit of reverse engineering, a bit of coding, and he wound up in complete control of the device. A decade ago, while RISC architecture was busy changing everything and people were wearing Utilikilts without beards, hackers were doing something amazing. They repurposed off-the-shelf routers and turned them into what we would now call the Internet of Things. Need to set up a PBX? A Linksys router will do it. Want to drive a remote control car over the Internet? It’s your old friend, WRT54G. Now that the Internet of Things is a thing, a few companies have realized people will buy bare bones router chipsets. It’s like an Arduino, or something, and it connects to the Internet. We’ll sell a million. Get Indiegogo on the phone. The Onion Omega2 launched on Kickstarter last year, and so far has seen some success. They’ve shipped their units, and people are generally happy with them. One thing that wasn’t mentioned in the Kickstarter was the fundamental problem with the design. The pins on this seemingly breadboard-compatible dev board have a pitch of two millimeters. Horribly broken. Huge mistake. Terrible deal. Not the best people we have working on this. Imperial is a superior unit of measurement. Metric is outdated. The Onion Omega2 won’t fit in a breadboard, but Onion does offer a breakout ‘expansion dock’ for $15 USD. There’s a better, cheaper solution, though. You can complain about it on Hackaday.io’s Hack Chat. That’s what [zach] did, and a few minutes later, [davedarko] whipped up a quick PCB design to convert the 2mm header to the much more logical 0.1 inch header. Imperial units win once again. After sending three dollars and twenty cents to OSHPark, [zach] had his pin adapters in hand. 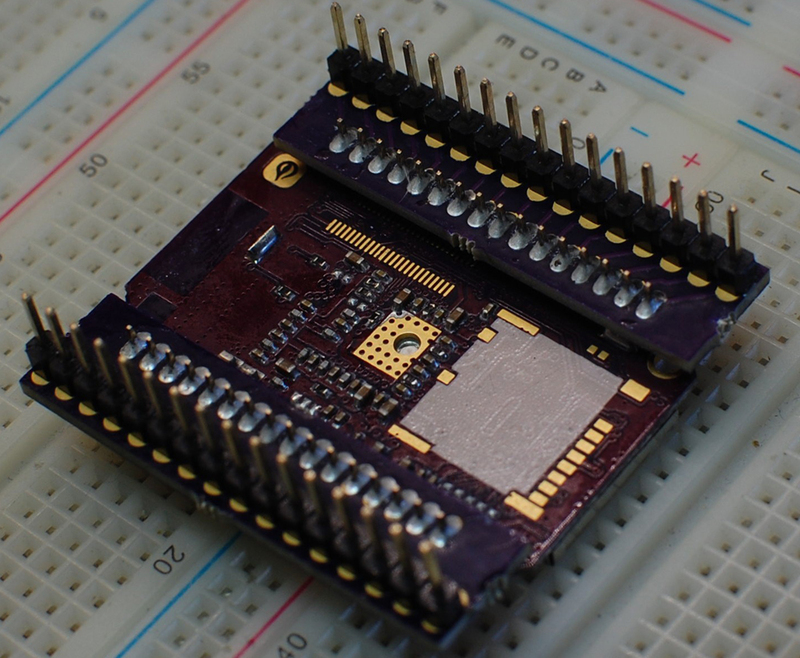 A few minutes with a soldering iron, and the Onion Omega2 is made compatible with every breadboard ever made. If you have an Onion Omega2 and would like a really cool hexagonal sticker, here’s the project on OSHPark.